Quick Delivery ! -Manufactured and shipped the same day. Used by numerous European & International Police and government agencies, Press & Aid Organizations, Security companies and VIP´s. Your Size = 3 - 4 cm larger than the largest area around your belly / stomach in cm. 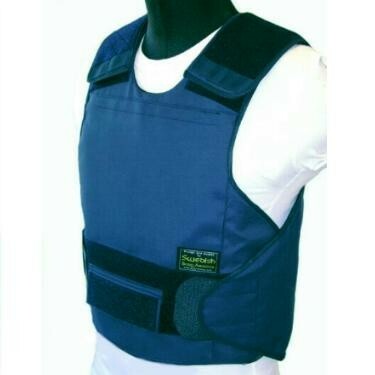 COMBO TAC ™ is an exclusive body protection vest designed to provide good ballistic and knife protection for vital organs such as heart, lungs, liver, kidneys, spleen and spine while keeping a low profile. Front and back panel overlap on the sides for maximum protection. The COMBO TAC ™ comes designed with adjustable shoulder and U-band™waist straps allowing the vest to be adjusted to almost any body shape or size. The vest is very easy to put on and comfortable to wear. A COMBO TAC ™ in size Large with protection level NIJ II weighs only 1,2 kg! COMBO TAC ™ can be upgraded with our SPV-PRO™ internal stab protective panels for higher stab protection levels, Ballistic plates to stop rifle & exotic threats (front and back), side protection panels, genital ballistic and/or cut protection, and Shoulder & Collar Pack that offers optional removable protection for the shoulders and neck. • -100% satisfied customer warranty. COMBO TAC ™ can be tailor made if necessary to fulfil customer’s requests or female special sizes. - Good fit is important for comfort and safety! References: Used by Swedish and Danish Police & Military forces often by Body Guards, ZAPATA & Engineering, Ronco demining-Security, American Embassy Bahgdad, CNN, FOX, NBC, AFP, CBS, SVT, SVR, DN, Associated Press news & Film teams and many more, thousands sold every year.